Comments: In the waning days of the James River and Kanawha Canal, the canal was conveyed to the Richmond & Allegheny Railroad (later C&O) by a deed dated March 4, 1880. Railroad construction workers promptly started laying tracks on the towpath. Canal freighters delivered railway ties along the Canal, stacking them on the towpath for workmen to lay track between Richmond and Lynchburg. 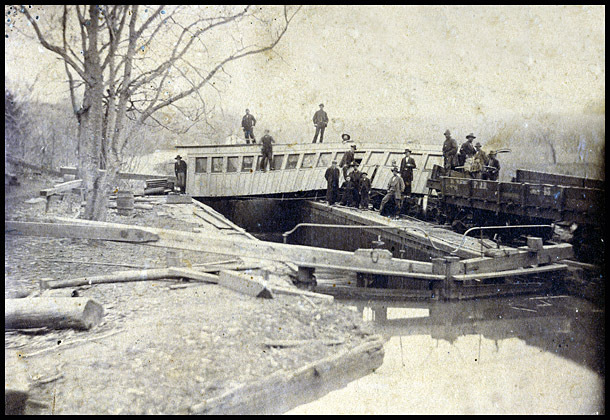 The railway section between Bremo Bluff and Scottsville was completed on March 17, 1881, slowed only by this accident at Lock 22. How did it happen? A lock contained four gates, each with a wooden balance beam about 20 feet long. When all the gates were closed, two of the balance beams stuck out over the towpath and were cut off before trains used the track. A descendant of Scottsville's Cleveland family, George L. Cleveland of Dana, Indiana, tells the rest of the story about the lock gate that wrecked a train: "One of the beams used to open the canal lock shown in the picture at right had been cut off to allow trains to pass. However, boatmen continued to use this lock to transport railroad construction materials west up the canal. They employed a makeshift beam to open the lock. Being unaccustomed to dealing with trains, they dropped the beam when finished and left it on the newly laid tracks. Later the work train pictured here, backing down the line, struck the discarded beam and caused the coach to jump the track and straddle the lock. This was reputed to be the first wreck on the new railroad. The man's head, showing above the center of the coach is that of my grandfather, George B. Cleveland, who is actually standing in the coach which split open in the wreck."